Once again, we leave the fate and destiny of the Dodger to the man above. He'll be pitching for the Dodgers in Game 6 this coming Saturday evening. "Obviously, our backs are against the wall, but we feel like we've been there all year, from Day One until the end," said Blanton. "We got down in Washington [in the NL Division Series], and everybody wrote us off then. I'm sure everybody is doing the same now, which is fine. That's maybe where we need to be. "We lost Game 1 in Chicago and everybody probably wrote us off then, saying we were going to be swept, but we came back and won the next two. We fight. We showed that in the ninth, we put up some runs when we were down a whole bunch. That's the character of this team." This Day in Dodgers History: In 1968 former Dodgers player and team executive Fresco Thompson dies at the age of 65. 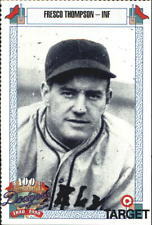 He played in Brooklyn from 1931-32, slashing .264/.350/.324/.674 in 209 plate appearances. As an executive he was the Dodgers assistant farm director, executive vice president and general manager. He presided over the 1968 draft, considered one of the best ever, that included Steve Garvey, Davey Lopes, Ron Cey, Bill Buckner, Bobby Valentine, Joe Ferguson and Doyle Alexander. Happy Birthday: Bill Russell, Franklin Stubbs and Zack Greinke! Via ESPN; "Social reaction to Vin Scully's return to Dodger Stadium as spectator for NLCS Game 5." 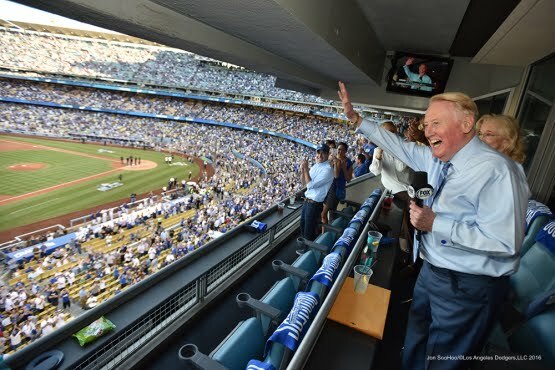 Vin Scully, the legendary Dodgers broadcaster who concluded his 67-year career on the final day of the regular season earlier this month, returned to Chavez Ravine purely as a spectator to see which team would take a 3-2 lead in the deadlocked series. Go here to watch a video of Vin repeating (likely for the last time this year) his immortal phrase: "It's Time For Dodger Baseball!" A small victory, I suppose. Via Adam McCalvy at MLB.com; "Turner breaks franchise playoff on-base record." Dodgers third baseman Justin Turner broke a 60-year-old franchise record in his team's 8-4 loss in Game 5 of the National League Championship Series on Thursday, when he reached safely in a 15th consecutive postseason game. 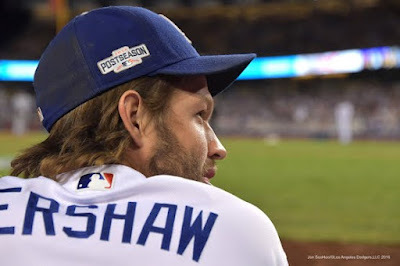 Via Adam McCalvy at MLB.com; "Kershaw ready for Wrigley in must-win." "Obviously, the fans [in Chicago] are pretty excited about their team this year, and rightfully so," Kershaw said. "They've been waiting a long time for them to win. ... Pitching on the road is obviously different, but you try and keep it the same as possible. D.C. was one of the louder environments that I've pitched into, so I've gotten to do that now a few times. I guess I'm as prepared as I'll ever be for that." Via Ken Gurnick at MLB.com; "Blanton searches for fix to slider." "That's been my best pitch for probably a year and a half or so, and to hang it twice, both ahead in the count, and get beat on it twice. … Sometimes you get lucky when you hang it, and sometimes you don't," Blanton said of the slider. "The goal is not to hang it, especially in those counts, and that's what I'm doing right now." Via Joel Sherman at the New York Post; "Behind Dodgers’ plan to escape their own misery." An old friend. Via Ryan Lawrence at Philly Voice; "The Q&A ... with former Phillies outfielder Shane Victorino." He doesn't talk much about his time with the Dodgers, but he does chat a bot about the current NLCS. Who are you rooting for in the NLCS (the Cubs, team you were with in spring training vs. the Dodgers, team with three of your ’08 Phillies teammates)? Aaah, I just want it to be a good one to be honest with you, and I’ve always been that way. When I’m not in it, I just want it to be great games, not blowouts where you just want to turn the TV off. To me, even playing in it, you can tell the difference between the games. But it’s also nice when you’re playing to be up 10-3 or 10-2, blowing a team out. But as a fan, or even a player who played the game and gets the adrenaline rush, it’s awesome to watch. I just love that these games have been close.